James G. Willie knew the trek would be arduous when he left Iowa City in July 1856, leading 500 handcart pioneers on a 1,300-mile journey across the plains. But he could not have known that his people would run out of food while still hundreds of miles from Salt Lake City nor that the winter of 1856 would begin in the middle of October with prolonged, severe storms. Sixty-nine members of his company would die along the way. Yet from this tragedy emerged triumphant stories of personal endurance, courage, heroism, and unwavering faith. 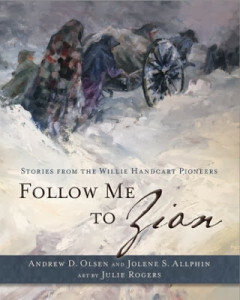 Follow Me to Zion recounts 20 compelling stories of members of the Willie handcart company and their rescuers. Dozens of full-color images by artist Julie Rogers enrich this keepsake volume, which pays tribute to the men, women, and children who have become enduring witnesses of the power of faith and sacrifice. Here you will find excerpts from their own accounts of the journey, learn what those faithful pioneers did after reaching the Salt Lake Valley, and read reflections on their lives by descendants. The simple words “Follow Me to Zion,” cross-stitched onto small pieces of fabric kept in the journal of a handcart pioneer, are an invitation that still calls to us today. The stories and paintings in this beautiful volume can inspire us to live true to our faith and reach out to help others do likewise. This book also contains the most comprehensive, up-to-date listing of members of the Willie handcart company. Review: I’ve heard the stories of the Willie and Martin handcart companies over the years, but never have I seen such a collection of personal poignant accounts as were collected in Follow Me To Zion. I knew I needed to grab a box of tissues when within the first two chapter I was already in tears– in awe with the fortitude, faith and determination of these pioneers. James G. Willie, captain of the company left his young family behind for four years to return to his native land of England then bring immigrants back to Salt Lake via an overland trek with handcarts. This was no easy journey. It required they board a ship bound to America amongst winds so strong they knocked passengers to the sides and bones were broken. Provisions ran out before New York was reached. Then a long rail journey to the end of the line and a trek on foot through Indian territory through mountain and and snow. Yet, these Saints pressed on, knowing full well they were leaving late int he season and may lose their lives in their quest to reach a land where all those who believed as they, were gathering in Utah. Those family members who carried their brothers and sons upon their backs when the snow was too deep for them to walk. James Kirkwood who lost his life carrying his younger brother to camp. Emily Hill who was starving herself, yet saved the only onion given to her by rescuers on to another. Bodil Mortenson, a young girl of 10 who dies gathering bits of sagebrush for a fire amid the snow. So many laid down their lives along the path to religious freedom. Yet their legacy lives on in their descendants who continue to tell the stories and feel the influence of their ancestors beyond the grave, as angels. This book is unforgettable. The lay out is beautiful with thick pages and commissioned painting by Julie Rogers. I am so grateful for the authors who gathered all the Willie pioneer history into one book so that their memory may live on. Thanks so much to Deseret Book for offering us a book in exchange for an honest review. Andrew D. Olsen is an editor for The Church of Jesus Christ of Latter-day Saints and the author of The Price We Paid: The Extraordinary Story of the Willie and Martin Handcart Pioneers. Andrew and his wife, Linda, are the parents of 3 children. Jolene Spendlove Allphin has a love for the 1856 pioneers and rescuers that continues to grow. She has published nearly 300 biographical sketches of them in Tell My Story, Too. Jolene and her husband, Michael, are the parents of 11 children. Julie Boswell Rogers is an acclaimed artist who has won many awards. Her art has been featured in Church publications, visitors’ centers, and the Church History Museum. The book Emma, the Elect Lady contains many of her paintings of Joseph and Emma Smith. Julie and her husband, Russell, are the parents of 5 children.